During the Canada Goose protest I had to take a break to get some food, refuel and rest my voice! 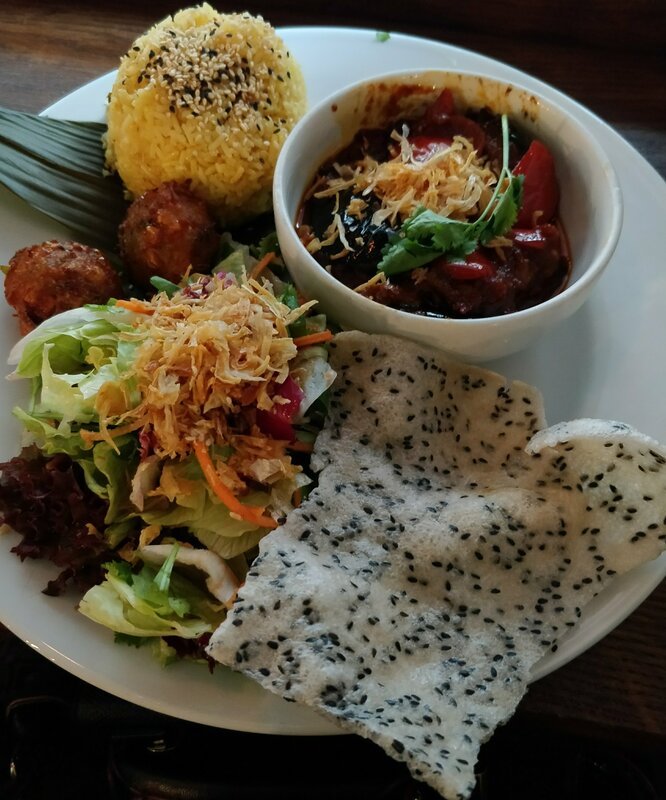 I headed over to Wardour Street as I know they had lots of vegan options. I had my main course at Banana Tree, I love that they automatically hand you a vegetarian menu with the main one to make things easier. I went for the tamarind aubergine combo which comes with rice, corn cakes, salad and a sesame cracker. The curry was the right level of spicy for me and I mixed in the rice to balance it out for me. The dressing on the salad was also really nice and I do love a good corn cake! 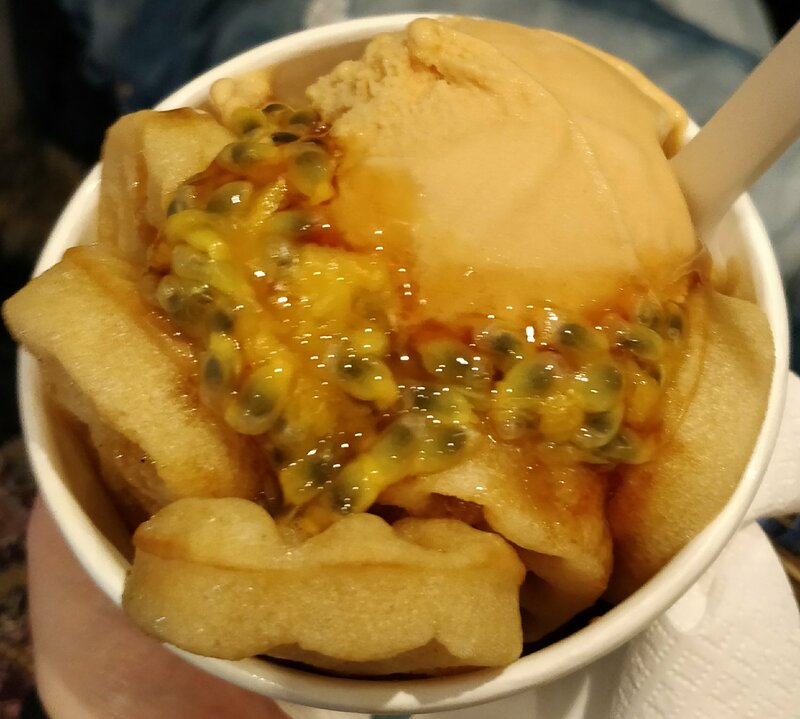 I headed over to Yorica (pronounced Eureka) for dessert and had waffles with mint choc chip and salted caramel topped with passionfruit and caramel sauce. I thought it was a little pricey but but it’s such a rare treat I didn’t mind so much. The flavours were fab and mint was a definite fave of mine pre-vegan and it’s so hard to get hold of a vegan version! I know when I’m in the West End there’s always plenty of options for me down Wardour Street so I’ll return time and time again. Have you been? What would you recommend? Let me know in the comments below. Review – Top Dog and Yorica! I had been really excited about trying the offerings at the new vegan ice cream parlour Yorica! in Soho since I heard about its opening and started seeing all the pics popping up on my instagram feed! I saw a few people had coupled this with a trip to Top Dog a hot dog joint that also serves vegan hot dogs and burgers which is just around the corner and, as I am very fond of a vegan dog I thought we’d follow suit! I had seen mixed reviews of Top Dog online but the owners had responded to most of the negative comments stating they were trying to improve and welcomed constructive feedback. They also seemed to have had a bit of a refurb as the restaurant looked different to the photos I had seen online. I had a look at the menu online and was pleased to see the extent of the vegan options including fried pickles, Kentucky fried cauliflower and onion rings as sides as well as a couple of main options which were available either as a hot dog or a burger. When we first arrived we were asked if we were vegan as they were awaiting a delivery of their gluten free, vegan buns. They said they could either work something out serving on a bed of lettuce or if we wanted to come back we would get a discount. I was really hungry so we decided to stay and work something out. When we were seated the waitress went through what was vegan on the menu, I was a bit confused as what she said did not correspond with the labelling on the menu. She advised that the labelling was incorrect and they needed to get the menus updated but said she would check everything with the kitchen to make sure it was vegan. I chose The American hot dog with sweet potato fries and had fried pickles to share with my husband. After we had ordered she said they had found a couple of gf buns so I was able to have a proper hot dog. Both my husband and I love gherkins, we, well mainly he (!) have gotten through two jars in the last week and I love absolutely anything pickled (vegan of course!) so we were looking forward to the deep fried pickles. The batter was crisp on the outside and they tasted delicious dipped in the barbeque sauce that accompanied them. The only negative thing I would say is that the portion seemed a little stingy for £4, but I do appreciate this is in a central London location. When my hot dog arrived it didn’t look like what I expected. On the menu The American is described as “House sauce, onions, lettuce, homemade pickles and relishes”. The waitress had said the vegan version wouldn’t have the house sauce, but there were no onions or lettuce to speak of and a lot of what I assume was the homemade pickles and relishes although I couldn’t distinguish between them. I didn’t query it as at the time I couldn’t remember exactly what the menu had said. As soon as I picked up the bun it split in two as did the hot dog sausage. I ended up forking the sausage and relish onto the bun in pieces. I didn’t say anything to the waitress at this point as I knew I had had the last of the vegan buns! The bun tasted quite dry which I think was because it was gluten free, unfortunately the trend for brioche buns has has followed from burgers to hot dogs so the regular version wasn’t vegan-friendly. Also because there was so much cold relish on the hot dog it made everything else cool down as well. After I had finished my hot dog I looked across at another table and saw there was a ketchup and a mustard bottle on there and thought mine would have been much improved if I had thought to ask the waitress for some. Afterwards I did think it was a bit strange not to have ketchup and mustard on every table with the condiments in a hot dog restaurant. My sweet potato fries were nice but again I didn’t think they were great value for money at £4. I was really hopeful for Top Dog and hope they do improve in future as it is great to have a place to grab a vegan hot dog in London. I might have to go back just to try the Kentucky fried cauliflower and have the pickles again! After a walk around Soho Square to let our food go down we headed to Yorica! I had already decided I wanted the matcha and chocolate frozen yogurt (froyo!) with marshmallows but I also fancied trying a couple of the ice cream flavours. Unfortunately it was really busy and didn’t feel like I could hold up the queue taking my time perusing. The shop was full to the brim so we sat on the bench outside to enjoy our froyo. I love anything matcha flavoured since we went to Japan last year and this did not disappoint. I also enjoyed the chocolate flavour (you can’t go wrong with chocolate!) and the marshmallows (I think these were Freedom Mallows brand) were a great addition. It is so lovely to walk into a place like Yorica! and know you can have absolutely everything they have to offer. They offer three sizes, we went for the middle one expecting the standard (the smallest size) to be on the stingy side. Our preconceptions were completely unfounded and we struggled to finish, so next time I know the standard will be enough for me! I really look forward to going back and trying out some of the other flavours and toppings. I have been told its less busy in the week and as they are open until 10pm on Monday to Wednesday and midnight Thursday to Saturday I might have to stop by after work one evening! Have you been to either Top Dog or Yorica? what did you think?